If someone sneezes on our property, we have to clean up branches from all the trees. So, it’s not hard to imagine how many branches we collected yesterday after the terrible storm system which went through this past Sunday evening. Wagon load upon wagon load to be exact. But hey, we did it as a family, so it wasn’t too bad. And the boys love it when we collect fallen branches because they know it means we will be having a fire in the makeshift pit out back. Sure enough, we stacked those branches high in teepee formation, added a little dryer lint and old sales ads… and whoof! FIRE! Of course, when you’re burning rotten wood, it burns fairly quickly. Before we went to bed the fire had burned down, leaving only white-ish gray ash. I walked by it and checked on it. No heat. No flame. No sign of embers. Good, fire’s out. As I got out and about this morning working on a project for an illustrated message, I looked at the fire pit and noticed a small whiff of gray smoke coming from what was left of a piece of a log. Hmmm… That’s interesting. So I investigated. As I got closer, I noticed a stiff breeze was blowing from around the side of the house and right over the fire pit. With each gust of wind came another whiff of smoke. Then the wind became more steady… and so did the smoke. Then I noticed an ember or two. There were sticks around the edges of the fire pit which had escaped burning and so I quickly gathered a few of them and put them on the area where the embers were. The continuing wind blew away the dusty ashes to reveal the underside of the log was still full of embers. And as the wind blew, the embers finally received the oxygen they needed to be fanned back into flame. Soon, they began consuming the small twigs I had placed over the embers. Realizing that we had fire again, I quickly grabbed the rest of the stray branches which had not burned and began to toss them into the flames so as to finish off our burn job. 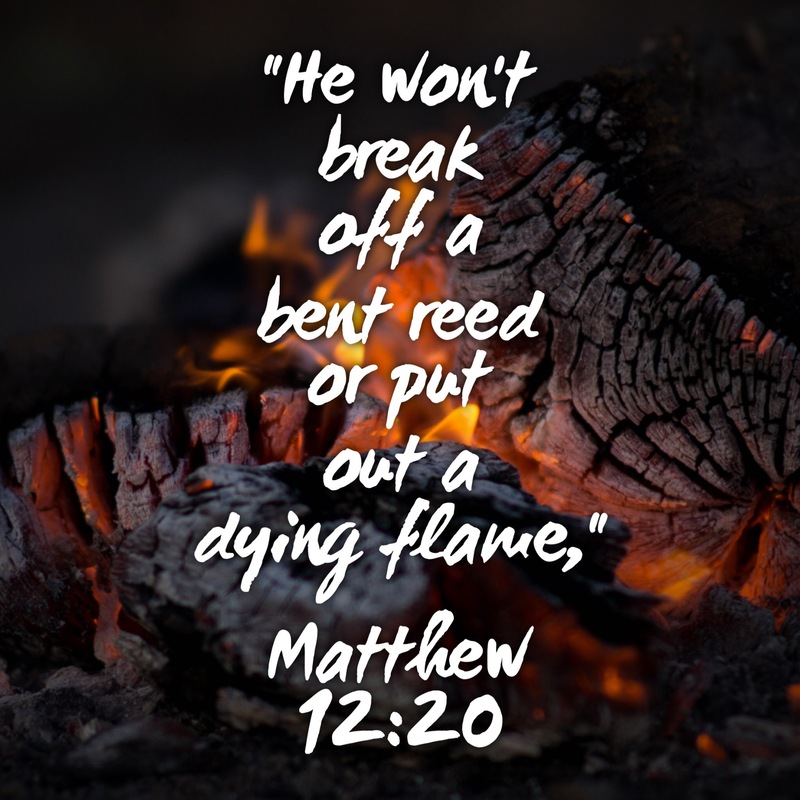 As I put those sticks on the new fire, something came to the forefront of my mind… namely that this is exactly how God can work in each of our lives, too. It can look like everything is dead… over… done with… put out… finished. Our lives can seem to be hidden in the ashes of what once was. But hidden underneath that gray ash are embers which cannot be seen. All is not dead in you or me. And all it takes is for God to begin blowing His life-giving breath across our lives to revive what is laying hidden. Scripture tells us that God will give us beauty for ashes. And it says that He will not put out a dying flame. God blows on the embers of our lives— not to put out the little burning that is left but— to fan into flame once more what remains so that that we can be active and powerful again. And it can happen in an instant. We can feel cold and lifeless one moment, only to burst into a flame-filled life in the next. So don’t give up because your life looks like the fire is out. Can you feel it? There is a breeze beginning to drift your way. It’s building in intensity… and soon you will be, too! Glad… that’s what I hope it does for all who read it.